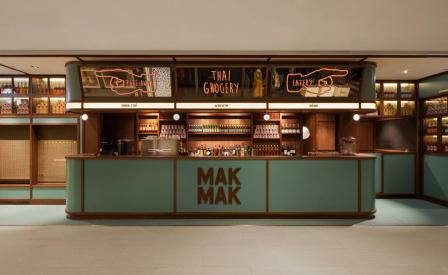 A new addition to Hong Kong’s ever-growing culinary scene, Mak Mak is a whimsical replica of a 1960s traditional Thai shophouse complete with a colourful grocery shop facade and ’home’ tucked away inside. Designed by interior architect Nelson Chow, who is known for creating authentic back stories for his other projects such as the burlesque-inspired Mrs Pound bar and Foxglove’s Kingsman-secret-service-style speakeasy, the 2,000 square feet space does double duty with the entrance counter, featuring a beguiling traditional neon sign and vintage car headlight-inspired lamps, acting as an enticing Take Away. Inside, walls lined in traditional green, coral and white handmade tiles and contemporary custom-designed timber furniture are a nod to vintage style, though crisp graphics and Chow’s bespoke collage artworks created from Thai grocery packaging help avoid any danger of pastiche. The quirky yet authentic atmosphere is an inspiring backdrop to the fuss free menu featuring classic Thai favourites like Pad Thai and Massaman lamb curry.